The Stormwater Management Academy team prepares Bold & Gold™ for an upcoming deployment. The patented soil media is deployed on more than 50,000-sq ft of green roofs throughout Florida. It’s hard to miss the lush, green tropical lemongrass and other plant life that adorn the “green roofs” that are sprouting on buildings throughout Central Florida and beyond. What you might not see at first glance, however, is the innovative soil media that keeps the grasses and plants firmly rooted and thriving. 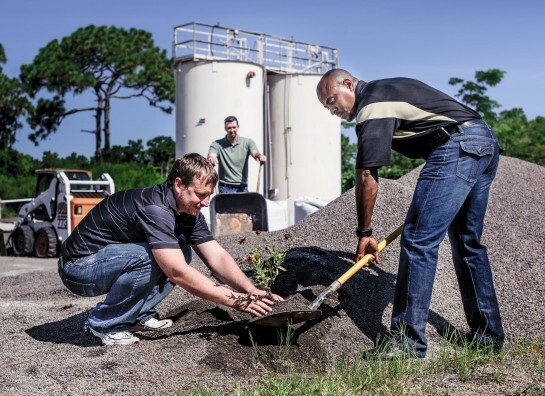 Developed by the University of Central Florida’s Stormwater Management Academy, the patented Bold & Gold™ soil media also provides significant filtration and reduction of stormwater runoff and is now deployed on more than 50,000-square feet of green roofs throughout Florida. For its part, the Bold & Gold soil media sits on top of a roof’s waterproof membrane—typically already in place as part of the roof infrastructure—and provides a 2- to 6-inch deep filtration layer. Bold & Gold provides exceptional extraction of pollutants, reduces the overall amount of runoff, and serves as a fertile material for plants and grasses to flourish. Dr. Wanielista and other UCF professors, graduate students and undergrads are conducting pioneering work in stormwater research and have developed several pollutant-control and plant-growth variations of Bold & Gold. The soil media is deployed on numerous green roof-related projects throughout Florida, including several buildings on the UCF campus. It also is used on green roofs at other universities and a number of commercial and government buildings around the state. In addition to stormwater management, pollutant extraction and roof durability, other benefits of a green roof include effective water diversion, aesthetic enhancement, improved energy efficiency for the underlying structure, and moderation of urban heat island effects. Green Roofs for Healthy Cities, the green roof and wall industry association, recently reported a 10 percent growth rate in green roofs for North America in 2013. Composed of expanded clay matter between the size of a coarse grain of sand and a popcorn kernel, Bold & Gold also is used for septic drain fields and stormwater infiltration. Work on the soil media began a decade ago. Initial research funding related to the Stormwater team’s green roof efforts was through the Florida Department of Environmental Protection. Today, the Stormwater Management Academy, which is part of UCF’s Department of Civil, Environmental and Construction Engineering, is working on a number of programs with industry- and government-funded research related to stormwater management, including green roof technology. For more information, visit stormwater.ucf.edu.